I get my steak from Pino on Sullivan Street. I have been buying meat from him for 40 years—since the time he was working for his uncle Tony at Florence Meat Market. I was planning a vocation devoted to food and appreciated deeply the respect with which he handled the different cuts of meat, wrapping them carefully in butcher’s wax paper as tenderly as if they were a newborn child. Now he is owner of his own Pino Prime Meats with his two sons Sal (who came up with the fantastic idea of aged prime steak ground for hamburgers) and Leo often at his side though Leo is still in school so only comes in during school holidays. Gustavo, his right hand man, is also very knowledgeable and exceptionally kind and loyal. I feel like so much a part of the family that one day when Pino’s wife was visiting and everyone in the shop was speaking Sicilian Italian I piped up in my limited accented version: anche io, sono Siciliana (I too am a Sicilian). Everyone laughed. I do have a close cousin who is Sicilian—Elizabeth Granatelli—whom I call la principessa as there is a street named after her family in Palermo. And then, of course, there is my sister/baker Angelica Pulvirenti who grew up in my favorite town in Sicily—Ragusa. Back to the steak which has prompted this posting. 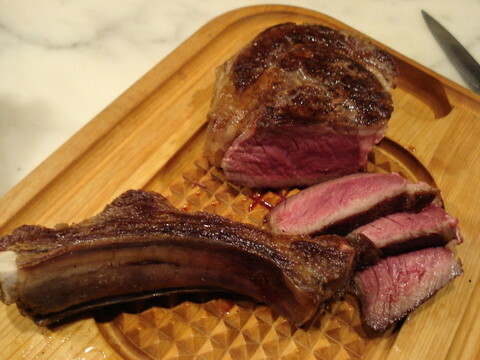 First of all, my favorite is the rib steak (as Pino calls it rrrrrib steak). It is aged for one month and I ask him to cut it two inches thick as we like rare. In fact, if I’m grilling it outdoors I ask for 2 1/2 inches. Even 2 inches is enough for two meals for the two of us. In recent years I’ve been making steak only outdoors on the charcoal grill but as the meat is so wonderful I decided to try a new technique in my NY city apartment. The goal was to get a crunch deeply brown exterior and rare interior without smoking up the whole apartment. And it worked perfectly. Here’s how: As soon as you come home with the steak salt and pepper it all over (i use about 1 1/2 teaspoons of salt. Refrigerate it until 1 hour before cooking. Preheat the oven to 500°F/260°C for a minimum of 45 minutes. If you have an oven stone all the better. About 5 minutes before cooking, preheat a large cast iron skillet until smoking hot (an infra-red thermometer will read about 535°F/279°C. Place the steak in the skillet and cook for 3 minutes or until deeply browned. Fold a paper towel into a small square and with tongs absorb any of the fat that is exuding. Turn the steak over and set the skillet in the oven (on the stone). Continue cooking for about 8 to 10 minutes or until an instant read thermometer registers no lower than 105°F/40°C. and no higher than 115°F/46°C. if you like rare, higher if you like it more cooked. Different parts of the meat will register different temperatures so I like to give a range. After a few minutes in the oven use the tongs to dab out the fat. Do this as necessary to prevent smoking. 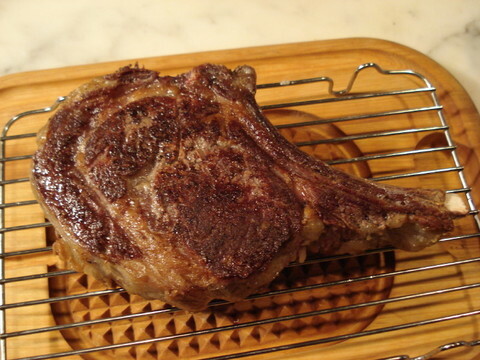 Remove the steak to a rack to keep the exterior crunchy and allow it to sit for 10 minutes before carving. Set it on a carving board. There will be blood (sorry Daniel Day-Lewis--meat juices)!